Ministry of Power and Energy :: Korea’s concern towards renewable energy sources of Sri Lanka …..
Korea’s concern towards renewable energy sources of Sri Lanka …..
Korea paid special attention towards the proposed solar power and wind power systems. A program to share the technical knowledge between two countries. 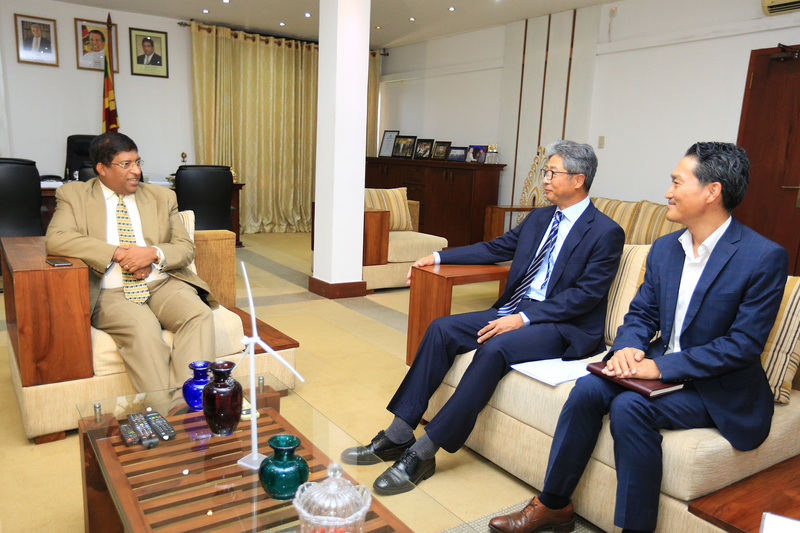 In order to enhance the bilateral relationship between the two countries the ambassador His Excellency Heon Lee of Korea held discussion with Honorable Ravikarunanayake the minister of power, energy and business development. The discussion was held yesterday (22th) at the ministry of power, energy and business development. Special attention was paid towards the power generation of Sri Lanka. The attention of the Korean ambassador was drawn towards the renewable energy program that launched already. We assured that his country could support not only in terms of economy but also to develop the environment as well. Traditionally water is the main source in generating electricity in Sri Lanka. We have to make use of water in a prudent way without harming to the environment. We must distribute the electricity to a low cost to the customers and provide an efficient service to the people. The water resources available in the country have been used in a prudent way to generate electricity said the minister. Although we have been using coal and other fuel to generate electricity the cost is very high. Therefore it is pertinent for us to use the solar power and wind power. Honorable minister explained to the ambassador of Korea. Already a program has been launched by fixing solar panel at the top of roofs in view of generating electricity in a efficient way. This program is called “ Sooriyabala sangramaiya” this helps to produce electricity in low cost and very beneficial to the customers as well. The additional electricity produced by this means could add to the national grid. Therefore the consumers benefit economically as well, pointed out Honorable minister Ravikarunanayake. Further minister explained regarding the power generation programs of Sri Lanka to the ambassador. 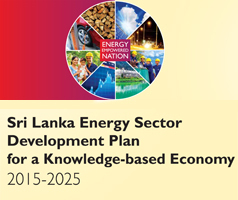 Sri Lanka is a commendable level regarding power generation and distribution of power. Further the ambassador of Korea said that on behalf of the Korean government he would extend the fullest support to develop the electricity systems of Sri Lanka. Further he said that he would inform to his country the power generation systems and programs existing in Sri Lanka and try to use some of the programs at Korea as well said the Korean ambassador.